Pirate party MPs Þórhildur Sunna Ævarsdóttir and Björn Leví Gunnarsson wore beanies with the letters "FO" at Parliement yesterday when MP Bergþór Ólason, involved in the scandalous Klaustur recording made a speech. The FO beanie is produced by UN Women and stands for Fokk ofbeldi, or "f**k violence," and profits go to women who are victims of violence. "A silent protest," explained Ævarsdóttir to mbl.is. 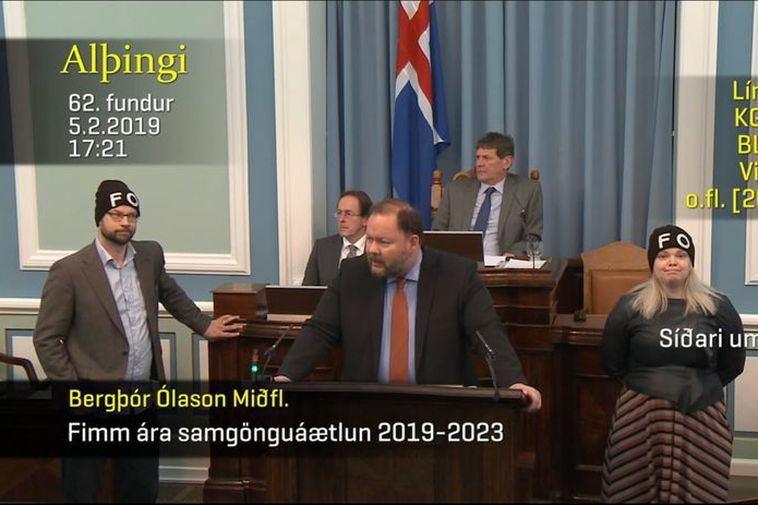 Ólason was speaking about Iceland's five year transport plan as he is still the chairman of the Parliament's environmental and transport committee. It has been a question of dispute whether he should still hold this position after his comments made public with the Klaustur recording. Among those comments were very crude sexual remarks about Iceland's Minister of Education. Ólason did not respond to the silent protest in any manner.